Hamtastic's top 10 cards you want cast against you. This idea was brought up when Petrified Plating was spoiled and we the people of the MTG Messageboards laughed about the possibility of stealing the Petrified Plating that our opponent suspended. This list isn't meant to be a list of bad cards, as some of them may end up being broken or abused. Some of these may end up being actually powerful against your deck somehow. No, no, no. These cards are in this list because of their ability to hurt their controller. I dub thee: Frankensteins! While this one has the potential to do a lot of damage, the end of turn clause is brutal. It has anti-synergy with that you'd want to run as you have to play out your hand every turn, and it doesn't amplify damage from permanent sources that you could have put on the board before you cast it. As a player I like the idea of taking my turn against an opponent with no cards in hand. 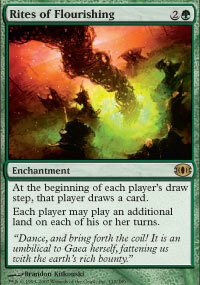 This little beauty is their land for the turn, and turns your kill spells into Land Destruction (oh noes! Blocked!) with a heaping side order of tempo loss. Everytime I burn one of these guys in the casual room I'm going to smile a deep, dirty smile inside. And while this guy doesn't use the stack (as per the title of this article), I'm still happy to see him in play. Green's "let's help nature grow" philosophy is great. But also great for the opponent. Giving your opponent the first shot at acceleration is usually a bad idea. Even if it's GG. Remember the old saying I just made up: "Free GG can lead to gg". The only time this really hurts is when I am out of cards, or somehow can't use two free mana. 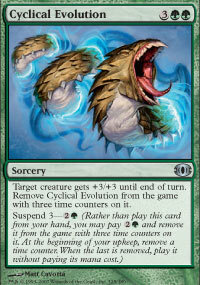 While you're trying to power up to a turn 2 Harmonize or some such I just got a turn 2 Persecute : Green against you. Thanks chuuuummmmmmmmmm... p.
As a control player, I'm happy to see this suspended accross the table. The chances of me being able to keep his creatures off the table while making him give mine the boost (on defense sure, but it's still a boost for my creature) is pretty good. 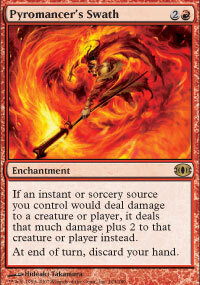 Not to mention that it's one of the most easily countered spells of the cycle. It has to target a creature, which makes any instant speed removal or bounce into a, wait for it, two 4 one. Same as Magus of the Vineyard. Giving your opponent first dibs on acceleration is usually not good. Add in card advantage and you've got yourself a card that will rarely help you more than your opponent. At first I thought this card had potential. Okay, so I'm a little sick in the head, but I thought he could be used in a Mono Black Aggro build. But the more I think about it and play with him, the more likely I feel that he's really good to see across the table. Strike 1: having him flip a second copy kills him. Strike 2: the only things that don't kill him are 2cc and less cards. Which, in general aren't going to be what actually wins the game. Strike 3: No evasion, or unsolvability. Any card that solves itself seems like a good card to see across the table. If he were actually worth the three mana and potential self destruction then he'd be scary. As it is, it's a 3/3 that will either die or show your opponent a 2cc or less card, or the knowledge that you're about to top deck a land. Okay, this guy's stats are impressive. 6/6 Trample for 4. Two words describe them stats: sah and weet. Oh, an upkeep? The upkeep is what makes me happy to see him. Either he draws you your removal for him, or he draws you enough creatures/burn/control to negate him. I a'int afraid of no Shah! Not too surprisingly, the top two are both Creature Aura's. Creature Aura's are generally bad news as they often involve getting set back on resources when the creature it's attached to dies. However, this one goes above and beyond simple card disadvantage. It actually give me a chance to steal the card and the mana and turn that was spent to suspend it. Instead of me getting a 2 for 1 card advantage, I get a 2 for 1 card advantage, a tempo advantage, and a resource advantage. Speaking of card advantage, if 2 for 1 card is good, 3 for 1 must be better. 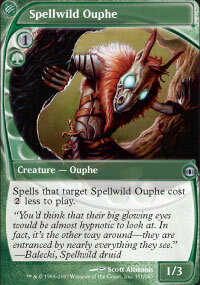 The big drawback to this card is the fact that it must be on a creature that's already enchanted. Meaning that when you kill the creature you expend 3 of your opponents cards for the 1 of yours. Even happening once in a game will likely be enough to tip the scales in my favor. So there you have it! The Top 10 cards I want to see on the other side of the virtual table. I hope you all enjoyed a little diversion. While this article won't improve your drafts or give you a new tribal deck to tear apart the casual room, hopefully it will give you a little something to look forward to in the Cas/Cas room of MTGO. You should try some of those auras with creatures that can't be targeted and killed so easily (Sihana Ledgewalker for example), then they arn't so terrible! Love the article but I have to disagree with your assesment of daybreak coronet. 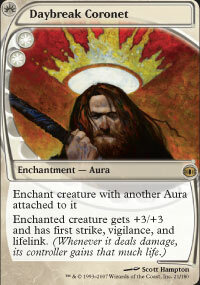 I run zur control on mtgo and since daybreak needs to be put on a creature which is already enchanted, shielding plax will already be there to protect from the 2fer. When Zur drops, and it should never drop without counter mana up, it pretty much means gg. I also rock 2x Heidar in the deck, and a coronet on a heidar is...well...amazing. Hadley, it would be very cool to see your Zur decklist. I opened Shah in a league... and thought "Hey. 6/6 trample rare- Bomb!" Oh how I was wrong...good thing this was during tiebrakers too. A fun article. I know I like these. 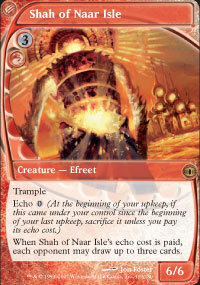 By the way Shah of Naar Isle could be a very good card in a Black/Red Hellbent deck that abuses Gibbering Descent. It's neat when you can gather those types of cards together and see patterns, like the fact that creature auras still have a big weakness, and green represents the "fun for everyone" types of cards. I enjoyed reading this, especially since I remembered my first game versus a beebers deck focused on the magus of the vineyard, I used the clubsandwich.dec. 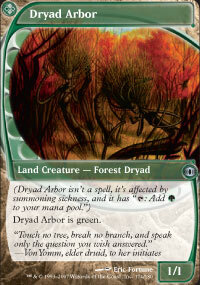 Just a comment on Putrid Cyclops and Dryad Arbor. 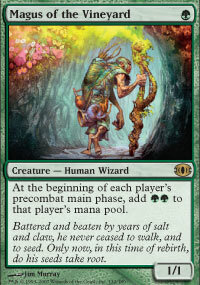 First of all, Dryad Arbor is seeing some standard play in forms of dredge decks that revolve around dread return, as to be frank, when it doens't have the mana to cast a creature, a land that does it is a creature in and of itself (synergy with Life from the Loam as well), can be quite powerful, and to be frank, I'd hate to be across the table from a dredge combo type deck if I didn't have sufficent hate. 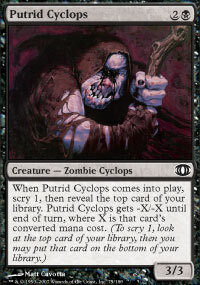 Putrid Cyclops I'm also on the about, but to be frank, I think it works really well in conjunction with dark confidant. Part of MBA is that after a certain point it doesn't want to draw lands. If your top card is a land, you can stuff it to the bottom of your deck, and in a MBA deck, reasonably believe that your putrid cyclops will survive. Then the next upkeep, you'll reveal the card that you already know to your opponent, and then draw yet another one. You gain a higher percentage of netting business relevant cards versus lands using that method. Only disagree with two evals really. Shah of NaarIsle, can't help but think of an owling deck or other decks where my opponent drawing cards is penalized. Sure, in other decks it's a problem.